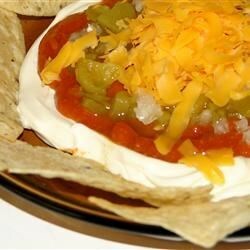 "This is an easy appetizer that you can make at the last minute. I never have any leftovers. Serve with tortilla chips." Spread cream cheese into the prepared pie plate. Top the cream cheese with chili, onions, chilies, and cheese. Bake at 350 degrees F (175 degrees C) for 15 to 20 minutes. Very, very bland...I ended up added quite a bit of cayenne just to give it a little kick. I will not be making this one again. Very quick and easy to make. We spiced it up a little. Very good.